Zigbee is applicable to the suite of high-level communications protocols for use in PANs (Personal area Networks with small, low-power digital radios. Applications include home automation, and medical device data collection, for example, where low power and low bandwidth is needed. TechPats has excellent expertise in Zigbee technology. We have a number of technical experts with over 25 years of experience in R&D, product development and development of standards. We also have testing capabilities for 802-15.4/Zigbee/6LoWPAN that allow us to conduct testing both in a lab environment. Other more traditional reverse engineering capabilities such as software RE and circuit extraction are also available when testing solutions are not sufficient. Figure 1 shows an example test setup for Zigbee testing. A number of Zigbee devices are interconnected and a monitoring device is capable of monitoring the communications between the Zigbee devices with the use of with a packet sniffer. 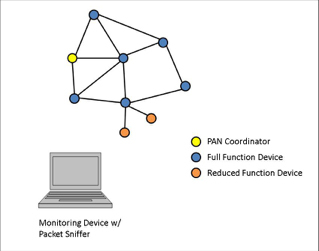 The monitoring device can be used to monitor mesh networks like the network shown in Figure 1 and also other topologies such as Star topologies and cluster trees. Applicable short-range wireless technologies include Bluetooth and BLE, Li-Fi (Light-Fidelity), NFC (Near-Field Communications), QR codes and barcodes, RFID (Radio-Frequency IDentification), Thread, Transport Layer Security, Wi-Fi, Wi-Fi Direct, Z-Wave and Zigbee. Medium-range technologies include HaLaw and LTE-Advanced while long-range technologies include LPWANs (Low-Power Wide-Area Networks), VSAT (Very Small Aperture Terminal) and Long-Range Wi-Fi. Wired technologies include Ethernet, MoCA (Multimedia over CoAx) and PLC (Power-Line Communication). 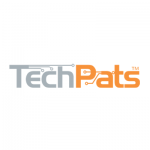 TechPats has a number of technical experts with over 25 years of experience in R&D, product development and development of standards related to most of the above technologies. We also have testing capabilities for that allow us to conduct testing both in a lab environment. Other more traditional reverse engineering capabilities such as software RE and circuit extraction are also available when testing solutions are not sufficient.